The rich embroidered design on the open collar shirt and texture of the Irish linen fabric tells you that this mocha color set has to made by Prestige. Prestige is a brand that makes some of the most unique and high quality Irish linen sets for men that you'll find. Irish linen has a cotton like feel that makes it a true luxury to wear when casual time is upon you. 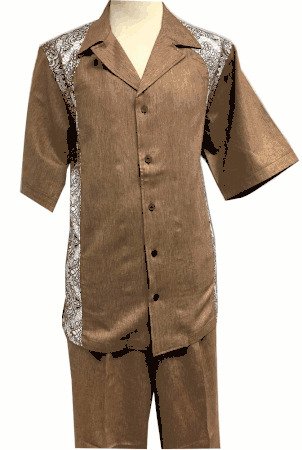 This mocha linen set features pleated pants.